Jasmine n. 1 A common name for plants of the genus Jasminum. 2. A common name for other plants that have heavily fragrant flowers. 3. A synonym for jessamine. also spelled jasmin. 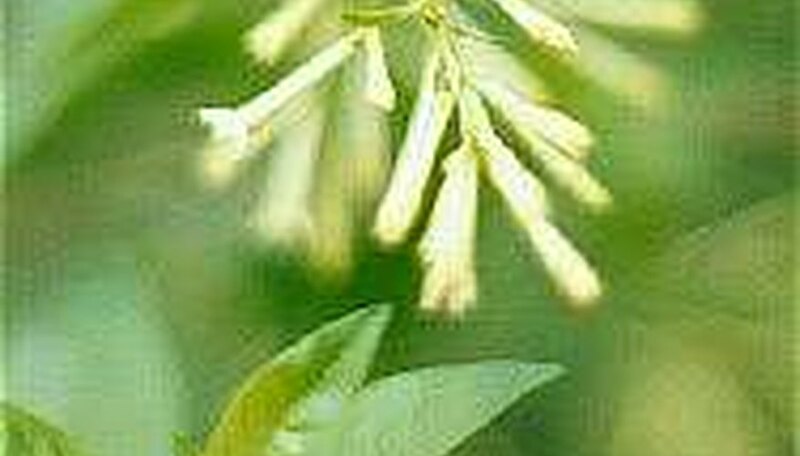 Jasminum (Jaz' mih nuhm) n. A genus of about 200 species of tender and tropical shrubs and vines. My love affair with jasmine began when I went on a trip from the Northeast to the Outer Banks of North Carolina, and visited a wonderful garden center on Manteo Island, not far from The Elizabethan Gardens. (And that's another article.) There in a pot begging to be noticed, and succeeding, was a lovely, shrubby plant with glossy green leaves, and a creamy yellow blossom whose fragrance was immediately added to my list of favorites. Along with iris, and lilacs. It was purchased quickly and accompanied me and my youngest son back to our motel room in Nag's Head where it stood outside next to our door. There is an advantage to buying plants when away. (I now visualize my eldest in the back seat, legs wrapped around a big beach plum bush purchased on Cape Cod and being transported back to western Massachusetts.) Returning to our room after sightseeing, and being greeted by a row of doors, it makes one's room immediatly identifiable. As the youngest said, "I can always tell our motel rooms, Mom; they're the only ones that are landscaped." This particular plant, I was to learn after much research, is Trachelospermum asiaticum. 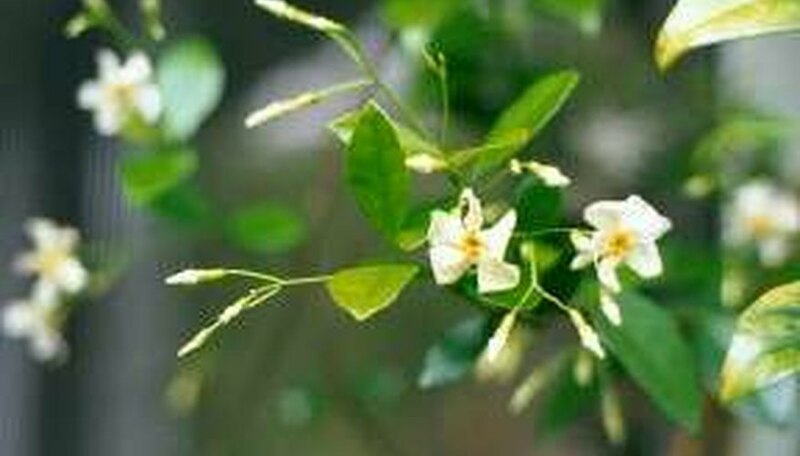 It is often listed as a "jasmine." It became one of my all time favorite plants. It lived inside in front of a window, with summers outside, for twenty years. Every February it began to bloom inside, and the house was perfumed. I loved it. Then it bloomed again outside on the deck and I always had a party in its honor. I kept it trimmed into a bush. As I was getting ready to move south, it began to expire. I was told if I had one in a pot that long, I'd been fortunate. But, it was like saying 'good-by' to an old friend. Flowering Shrubs Shrubs are among the most versatile of garden plants. They can fill the landscape with color, shape, and texture all year long, with flowers in the spring, lovely foliage in the summer, and berries and bright leaves autumn. They even add shape and texture to the winter garden. Although this bulletin deals mainly with flowering shrubs, the wealth of information can be applied to most any shrub. Fortunately, where I am, I have been able to plant some in the ground, and wound vine-style through vining Jasminum nitidum, they disguise downspouts and are treating me to their scent now. I'm delighted that mangrove skipper butterflies find them to their liking. They bloom lightly all spring and summer. Shrubs are among the most versatile of garden plants. They can fill the landscape with color, shape, and texture all year long, with flowers in the spring, lovely foliage in the summer, and berries and bright leaves autumn. They even add shape and texture to the winter garden. Although this bulletin deals mainly with flowering shrubs, the wealth of information can be applied to most any shrub. And on my side fence, is its close relative trachelospermum jasminum with a small pinwheel blossom similar to its creamy cousin's, except white. It blooms once in the season, in late Florida spring. Again, a wonderful fragrance. Both of them bring to mind spicyness, mixed with floral. People always ask what the delightful white flowered vine is. The blooms are like snowflakes scatterd over the deep green leaves. It can be trimmed right after bloom and keeps an orderly appearance. They get fed in my yard when I remember to, and are doing well. A couple of times a year would be good. They are sometimes called Confederate Jasmine. 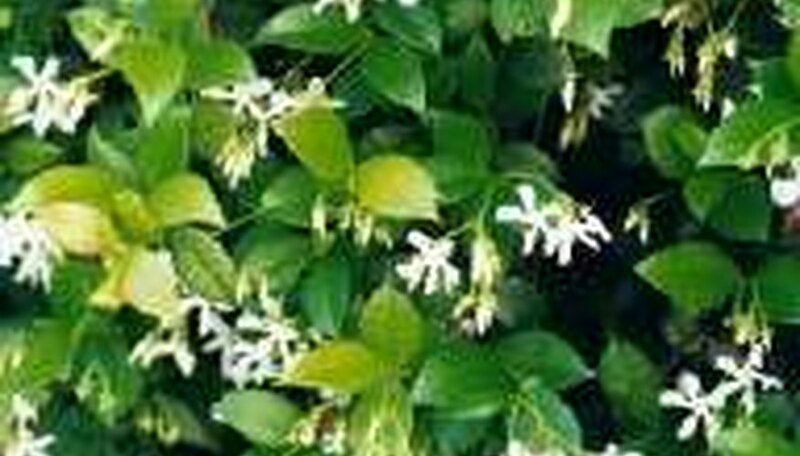 These jasmines can take sun or shade or a combination and are not fussy about soils. Here in Florida, they are both evergreen. And out in front, is a small creeper groundcover Trachelospermum which isn't planted for blooms, but its lovely evergreen foliage. I just like the family. I mentioned the Jasminum nitidum. It is like a many-armed starfish, again fragrant. They are really a jasmine, and a little looser in behavior, but I like them in spite of their morals. Their buds are tinted pink. They hail from the South Pacific and like to be in sun or broken sun. Feeding three times a year keeps them in fine condition. They do well in Florida's sandy soil, and not allowed to dry out. Just to be different, we will throw in the Carolina Jasmine, which is in truth a gelsemium sempervirens. Its name is from the Italian "gelsomino", meaning true jasminum. It grows in north and central Florida, plus other southern states, and is a lovely butter yellow. It grows well in hammock soils, but I've seen it covering fences in the Tampa area. Again, fragrant. It blooms in early spring. Then, I saw a can in the home center labled, "Night-blooming Jasmine" and realizing I'd begun a collection, I took my baby home. I planted it near the lanai, so it could be a lovely scent out there with the others. Scent in the day, scent at night. Ahhh. Two years later, I was hacking it back two or three times a year, to keep it from coming into the house. It is a gangly bush. This one is Cestrum Nocturnum. Its flowers are not ones to grab the eye, as it is night-blooming and keeps them closed. They are small pale yellow green, but when a bush of them releases its fragrance at night, stand back. They are small tubes, and at dusk, they draw the sphinx moths who know a good thing when they smell it. After dark, we partake of what the moth enjoyed earlier, a powerful fragrance that smells like nothing else. It can be noticed over several back yards. In fact, one night when it was large and un-macheted, I had to leave the lanai, as my eyes started to burn. I suggest planting it farther away from the house, but I do recommend it. Guests are always impressed. Whack it back after it blooms. It will be baa--a--aack. Several times a year. A lotta bang for the buck. For a jasmine bush that needs little shaping, but creates lovely dignified flowers, on an orderly plant, try Tabernaemontana divaricata. (Then try to say it! Just kidding.) It is also known as the "butterfly gardenia", is easily grown, and produces lovely semi-double flowers that remind me of a gardenia that stopped when it was ahead. Much easier to grow than a gardenia, its fragrance is gentle and increases at night. Its foliage reminds one of the gardenia. By the way, a beautiful common gardenia we all know and love is "Gardenia jasminoides", sometimes referred to as "Cape Jasmine." Is it any wonder we're confused? It grows well in container baskets. Keep it watered and in excellent light. And to add to your confusion and delight, is the Orange-Jasmine, or Murraya paniculata, a lovely shrub often sheared into hedges in south Florida, but not by me. I want to see those panicles of bloom that smell like orange blossoms. And why not? They are related to citrus. They can grow to 20 feet tall, but my podranea vine is stomping on it as it takes over the world. (It doesn't smell, but has lovely pink catalpa-like blossoms. Don't plant podranea unless you live on a large estate, which I don't, but I found out about its vigor too late. That happened to me with alot of things. It is now reaching across the fence to grab a neighbor's tree. It will succeed.) The Downy jasmine, Jasminum multiflorum, and the Arabian jasmine, Jasminum sambac, are two more lovely additions to the collection of things you can't live without. These can all be container grown up north and many catalogs provide a source. Summering outside in semi-sun will make most of them happy. Not a jasmine, but white and sweet is Osmanthus fragrans, the favorite "sweet olive". I remember a Charleston spring when these were blooming and the entire downtown garden area was perfumed. Lovely. My personal favorite mail order source for these is Logee's Greenhouse in Danielson, Connecticut. They have several more varieties and none will disappoint. Visit them on line at www.logees.com. It's a wonderful catalog. They are good enough to provide cultural hints. My new favorite "Jasmine" is jasminum lapin, a sweet brown bunny who lives in said shrubbery and produces a nest of babies now and then. She is very tame and the reason my four o'clocks dissappear. Now if you will excuse me, I must get ready for Cotillion!